In the previous section of this three-part essay, I made an argument for considering the scripted reality TV format as a cultural form that might both tell us something about the communities forming in the so-called time of post-truth, and proposed that instead of simply trying to counter fake-facts with “real” ones, we use scripted reality to think more closely about today’s relationship between representation and participation and consider how scripted reality blurs what it means to participate in reality — a category that has maybe become less representable than shapeable. In this second essay, I will extend this more explicitly through a number of artistic practices and explore what, if any, critical traction might be available to the scripting of reality. As Syms describes in a number of interviews around her 2017 exhibition Projects 106 at MoMA New York, she was hooked by The Real World as a teenager. And like Ann Hirsch who entered herself into the VH1 dating show Frank the Entertainer in a Basement Affair to take aim at specifically gendered roles and abuses enacted and reproduced in these formats, Syms has used the scripted reality format as a site to fold assumptions around race and gender back on to scenarios producing the reality they structure – notably as she did in her 2007 graduation work My Only Idol is Reality. In that work, Syms takes a scene from The Real World: New York in which housemates Kevin and Becky argue over patriarchy and a racist slight and repeatedly re-records the scene until the protagonist’s identities become fogged and the video starts to model the means by which “time, technology, and cognitive dissonance conspire to condition our understanding of oppression and short-circuit solidarity.”2 Though departing from directly re-articulating the scripted reality format in video, Syms has expanded this approach to the scripting of simultaneous narratives through multiple platforms set within unifying and participatory exhibition-scenarios. In both of these instances, participation becomes increasingly difficult to separate from the question of political commitment – with the degree of proximity of between audience and action setting the parameters of these forms.6 Yet, despite initially using participation to erase the boundary between art and social life, as Bishop’s often sparring-partner Nicolas Bourriaud also makes clear in Relational Aesthetics, participatory art has increasingly come to maintain a special place for itself in which to model “possible universes.”7 In retaining this autonomy in which to practice its participation as one that reflects, rather than being of the world, and since art no longer seeks to universalise these terms as a new standard or transformative horizon, participatory art must then also first be viewed in proximity to other ways in which participation has come to be deployed elsewhere. That is, whether it is, as Bishop reminds us, in “business as a tool for improving efficiency and workforce moral,” or as “ all-pervasive in the mass-media in the form of reality television,”8 or, as I argued in the previous piece, as the means through which globalised, digital and networked cultures like scripted reality are simply seen through participatory and relational forms, especially social media platforms. While participatory art might have tried to shore itself up against fully dissolving into the social realities it invited into the gallery by retaining art as the only real site where its project could take place, scripted reality’s relationship to participation is also mediated by a digital framework of engagement that today makes this separation difficult. At their most simple, digital files, data, and social media need interaction in order to be culturally, as well as computationally, meaningful. They don’t simply exist as stand alone representations. Digital files, in effect strings of positive and negative charges representing data in an abstracted binary form, need to be visualised or computed in order to become legible, whether to a person or by a computer. Data itself only becomes information when it has a context, and social media is worthless without relation through connection and contribution. The digital, therefore, demands additional levels of participation to make it concrete, to give it context. Participation, however, that is in terms also set by the digital. However, it would be wrong to claim that the historical importance of representation has been simply erased by the demands of digital participation: it is more like the two are conflated. As computer scientist Lev Manovich writes, when reading digital networked images, a phenomenon becomes “constituted by its representations and the conversations about it.”9 [emphasis added] Making sense of the image-sharing platform Instagram, for instance, is, as Manovich writes, a task of reading shared image-features at the scale of tens and hundreds of thousands, millions even. Unlike the “extreme exclusion” practiced by art history, “considering only tiny samples of ‘important’ or ‘best’ works from every period or field,”10 any instance of an online image can be contextualised by its interaction with a field of pre-determined terms and measures about that photograph. It is not simply a question of how one user might mimic another as a sort of style, but how the language of a platform allows (or prefers) certain kinds of copied image to be made. How often images appear is based on their metrics, for instance how many “likes” they receive, and the kind of image that get liked more will get made more. This metadata, the measurement of its measurements, is not only what allows images within a platform to be compared, but are also how they are understood, connected and thus collated by that platform. It is also how they are able to be represented in databases and participate in the relations drawn between them. Further, as media researcher Ramon Amaro has shown with his work on the racial bias of predictive and algorithmic policing tools, this participation is always already pre-determined by the attitudes that have framed and modelled the data used to train those tools in the first place.11 For instance, police data that claims to objectively map ‘normative’ and ‘non-normative’ behaviours in various neighbourhoods is both historically inflected and intersects with forms of discrimination or privilege that have skewed policing already.12 Amaro’s work is part of an effort to outline the social dimensions of computing to retrieve the bluntly obvious fact that the participation offered by data is as constructed as the reality it claims to represent. In this way, the critical necessity of participation in art to be somehow different or autonomous would again seem shaky. That is to say, taken together the implicit participation required by the digital and art’s ambivalent play with the boundaries of various degrees of participating, how participation (as a form of representation) can be made to interact or intervene with the reality it reflects, rather than observes, becomes a key critical gesture. Maintaining an even closer connection to scripted reality format’s use of performance, narrative and video, is the web series by writer Sarah M. Harrison and artist Wojciech Kosma, Charisma. They began working on the project to expand on their shared interest in the micro-scales through which emotional and social realities might be constructed through varying layers of performance and representation or narrative. A musical sitcom, Charisma follows its four-member cast as they interact in increasingly abstracted, domestic scenarios. The third iteration of a project (which began in 2015) follows the first season shot in NYC with three performers, two crew members (distinctions which quickly became blurred and eventually irrelevant) and about six guests; and a second shot across several locations around Europe with different performers and actors. 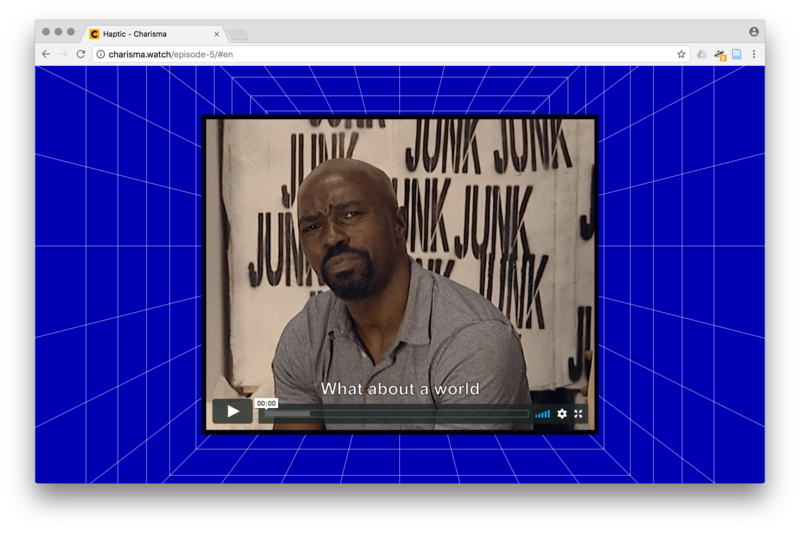 Experienced through the show’s website, which collects each of the six shows, Charisma’s narrative is constructed by viewers clicking on floating story fragments and backstories in any order. They’re very watchable, if only because what happens on screen is consistently cut short by the social-media-ready length of the event and the resulting feeling that you need to fill in the gaps. As Harrison describes, Charisma pushes the creative possibilities of the fictional (fiction “meaning lies about the truth”13): the words, “Every lie creates a reality in which it is true,” even scrolls across the bottom of one character, Asher’s backstory video. Yet, despite this seemingly disparaging depiction, the series is borne of a more complex interplay between the tropes of reality TV, documentary and performance where the fiction is consistently a collective enterprise. As well as over-emphasising on screen conventions and tropes, in Charisma there are frequent fourth wall disruptions. Cast, crew and the physical-set are “liable to be dragged into the psychological drama surrounding the making of the series.”14 Yet, as with the format more broadly, it is in the gap between its scripted and unscripted elements that it is able to deploy and distort “real-life” behavioural situations with allegorical weight. Zooming into subplots, while at the same time fleshing out cartoonish characters through their own subjective choices, viewers not only perform the scripting themselves by selecting which order to watch fragments of storyline, character thought and background, but come into contact with these realities through nothing but rarefied, raw interactions. Kosma has already worked with the scripted reality format over a four-day filmed workshop at the Museum of Modern Art, Warsaw, What Emotional Reality Do You Want to Live In?, in which participants explored social issues such as identity, sexuality, migration and religion. Using performers, dancers and actors to switch between “fiction and reality, “authenticity” and “artificiality, the private and public spheres” events were held together and situated within a public by the framing of the camera and the issues discussed could be suspended and express voices, feelings and intimacy usually marginalised by political debate. Missie dried her hands vigorously. Flo was still at Missie’s computer, trawling the debris on her news feed […]. Someone in Missie’s friends had caught Flo’s attention. […] “You are friends with Jamie London? How do you know Jamie London?” Missie didn’t know Jamie London, did she? Missie barely knew half the people she was friends with on Facebook. […] When Flo and Missie first became …friends, Flo took them to an inlet among the refuse of an ex-industrial port. He’d made a raft of foam and empty water bottles and string and fence palings secreted between the rotting remnants of a pier and an overgrown section of shore. […] Missie had been here on her bike a bazillion times and never looked twice. It wasn’t that it was hidden, it was that it existed in a different temporality. At surface level, this notion of performativity, negotiation of proximity and subversion might seem to be repeated in Bishop’s depiction of participatory art’s major methodological concerns: the activation of the subjects of participation; challenging the centrality of individual authorship; and focusing on a perceived crisis in the social bonds of community and collective responsibility. That is, it aims to break with generalisations of society through staging and drawing attention to the particularity of its interventions; doing this while relying on a proximity with those same social norms through its invitation of “real-life” participants — whether the public, amateurs, or symbolically-representative figures. But where Butler’s work aims to denaturalise the categories themselves, participatory art’s performance of these categories could also be said to contribute to the realism that grounds art’s authority; the authority with which it makes the claims it will rupture those categories. Participatory art’s incorporation of the intractability of anticipated codes Butler points to (anticipating the realism of its public) does not however foreclose its ability to make claims on transformation. Yet, the difficult, but necessary translation of Butler’s method notwithstanding (something she herself points at), the core of participatory art has (as both Bishop and Bourriaud argue) sought to represent versions of social reality in order that it can work on that trap and model alternatives that begin with the participants. Kosma and Harrisons’ work on the other hand seem to echo the art critic Maggie Nelson in her 2015 memoir The Argonauts in which she reflects on a growing dissatisfaction with Butler’s original statement. Simply working the trap, exposing and modulating it, is no longer sufficient. Instead, they suggest that the power of performativity lies not in how it modifies the representation of social norms and their repetition by individuals in society, but how the communality of performance can simultaneously be deployed to also exceed these — to shift, work on, and re-distribute practices of participation and cycles of anticipation within them. Moving between participation and performance here wouldn’t necessarily be to put “performance in opposition to ‘the real’,” as Maggie Nelson put it,21 rather, drawing the linguistic and psychoanalytic dimension of performance into the question of participation, calls into view the way that performance “dramatizes the ways in which we are for another or by virtue of another. The shift is subtle, but key to thinking about scripted reality as a form of intervention. Artists are no longer offering access to the utopias of the past by activating participants, asking them to replicate transformative encounters with an artwork in the wider world. Nor must they remain entirely faithful to given narratives in order to reflect the ‘real.’ Rather, the locus of participation, of working on the cycles of anticipation and repetition, as well as disrupting their interiorization, moves from activating the individual, to the collective task of re-making the surfaces and “realities” they share with those others. Those realities that we perform outwards as well as inwards. This communality was in part prefigured in the coalitions Butler spoke of, yet it was not collectivity as shortcut to transformation, as often understood in participatory art. As Butler made clear, “the iterability of performativity is a theory of agency, one that cannot disavow power as the condition of its own possibility,”22 that is the notion of agency in this process of decentring cannot be isolated from the dynamics that institute it in the first place. More precisely, in miming and displacing existing normative codes, such coalitions produce models of practice “whose future forms can’t be fully predicted,”23 but which must nonetheless be initiated. Returning to how artists like Kosma and Harrison might script reality through communalising affect and narrative, the question of making the agency (to perform representation communally, to invite participation), likewise becomes open-ended rather than predetermined. It is always re-workable. In this sense, the narrative forms stringing this task along are as effective in practice as documentary is in constructing representation. It’s also in this subtle shift that the focus of any community founded in a belief in reality moves from an emphasis on stabilising reality to reflecting on its effect in the construction of community as a central facet of that community. While in itself this repositioning of the burden of representing the real onto a communal actor is not necessarily transformative or “progressive,” already this shift offers a means by which to examine how narrative might intervene on, or construct, the imagined reality around which communities form. In part three, I will look at how this might be fixed and re-worked at the organizational level, how it might be the key to instituting new ways of knowing. This work was supported by the Arts and Humanities Research Council, UK. Tom Clark is an independent curator, editor and writer. He teaches and has run workshops on curatorial and publishing practice internationally. He is currently an AHRC/CHASE-Funded Doctoral Student at Goldsmiths, University of London, where his research explores infrastructural figures, politics and culture in art institutions.